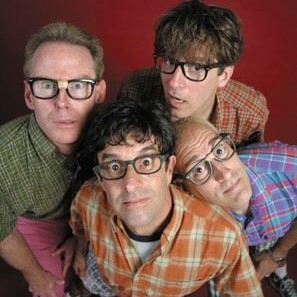 Often imitated but never duplicated, The Nerds have been redefining what it means to be a cover band since 1985. 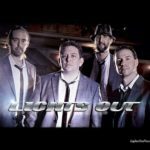 With the onslaught of cover bands playing alternative-grunge song lists, the Nerds stuck to their guns playing a little bit of everything that they like (R&B, blues, funk, dance, classic rock, hair band, punk, new wave, pop and Englebert Humperdinck). In the fall of 2000, they were asked to host MTV’s Ultimate Cover Band Contest as the house band. Besides MTV, the Nerds have also performed multiple times on “The View”, Carson Daly, and several other TV shows long since gone. Their posters have been on episodes of “Law and Order” as well as a new show “Love Monkey”. They have played many celebrity hosted events for A&E, ‘The Ed Show’, ‘Book of Daniel’. They have shared a stage with Sheryl Crow, Hootie and the Blowfish, Earth Wind and Fire, Train, The Go-Gos, Maroon 5, Southside Johnny, and more. 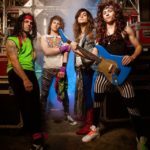 Over the years, Spaz, Biff, Stretch, and Mongo have graced stages from the Jersey Shore to Las Vegas, earning their reputation as “America’s Party Band Fun-omenon” every step of the way.